Distribution of small-bowel obstruction after gastric bypass. Computed tomographic scan showing an abundance of small bowel in the lesser sac. Computed tomographic scan showing dilated gastric remnant and duodenum with air-fluid levels. Objective To summarize our experience with small-bowel obstructions after laparoscopic Roux-en-Y gastric bypass. Patients One hundred five consecutive patients undergoing surgery for intestinal obstruction after laparoscopic Roux-en-Y gastric bypass between May 24, 2001, and December 1, 2006. Main Outcome Measures Common presenting symptoms, causes, yield of radiological studies, and types of surgical procedures performed for post–gastric bypass bowel obstruction. Results A total of 2325 laparoscopic Roux-en-Y gastric bypass procedures were performed during the study period. A total of 105 patients underwent 111 procedures. Bowel obstruction was confirmed in 102 patients, yielding an overall incidence of 4.4%. The most common presenting symptom was abdominal pain (82.0%), followed by nausea (48.6%) and vomiting (46.8%). Thirty-one patients (27.9%) presented with all of the 3 mentioned symptoms. The mean time to presentation was 313 days after bypass (range, 3-1215 days). Among the studies, results in 48.0% of computed tomographic scans, 55.4% of upper gastrointestinal studies, and 34.8% of plain abdominal radiography studies were positive for intestinal obstruction. In 15 patients (13.5%), all of the radiological study results were negative. The most common causes were internal hernias (53.9%), Roux compression due to mesocolon scarring (20.5%), and adhesions (13.7%). Laparoscopic explorations were carried out in 92 cases (82.9%). The incidences of bowel obstructions were 4.8% with retrocolic Roux placement and 1.8% with antecolic Roux placement. Conclusions Altered gastrointestinal tract anatomy results in vague symptoms and a poor yield with imaging studies. A sound knowledge of altered anatomy is the key to correct interpretation of imaging studies and prompt diagnosis. Obesity has reached epidemic proportions in the developed world. Roux-en-Y gastric bypass offers an efficacious and reliable method of weight loss. Over the last decade, the number of bariatric procedures performed each year has grown exponentially. It is conceivable that general surgeons will encounter postoperative complications with higher frequency owing to an increased number of index operations performed. Intimate knowledge of postbypass anatomy and careful interpretation of imaging study results are essential to prompt diagnosis and treatment of this group of patients. 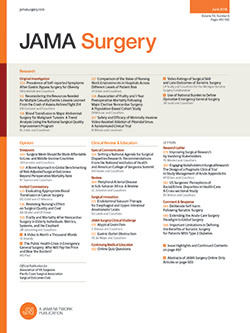 The proven efficacy of laparoscopic gastric bypass has resulted in the increasing popularity of this procedure and is currently the most common bariatric procedure performed worldwide.1Compared with its open counterpart, the laparoscopic approach results in lower rates of wound complications and incisional hernias and a shorter hospital stay; however, there seems to be a higher incidence of bowel obstruction after laparoscopic Roux-en-Y gastric bypass (LRYGBP).2-4 This article discusses experience at our center with the management of post-LRYGBP intestinal obstruction, with special focus toward clinical presentation, etiology, and the diagnostic clues used. A retrospective review was performed between May 24, 2001, and December 1, 2006. Operating room records were reviewed to identify all of the patients undergoing surgery to relieve intestinal obstruction after LRYGBP. Patients with gastrojejunal strictures were treated endoscopically and were not included in this series. Also, intestinal obstructions occurring after open bypasses were excluded. Records were reviewed to note presenting symptoms, imaging studies used, causes identified at exploration, and type of procedure performed (laparoscopic vs open). Operative notes were analyzed to assess the technique used to perform gastric bypass (antecolic vs retrocolic Roux limb placement). Statistical analyses were performed using χ2 tests, and P < .05 was considered statistically significant. Procedures were performed using five 12-mm trocars. Initial access to the peritoneal cavity was gained using a trocar with visualization at the left upper quadrant or umbilical region. The remainder of the trocars were placed over the right upper quadrant, subxiphoid, and left flank regions under direct laparoscopic visualization. The jejunum was divided about 30 cm from the ligament of Treitz using a linear stapler. A side-to-side enteroenterostomy was accomplished using a linear stapler 150 cm distal to the point of jejunal division. The resultant enterotomies were closed using 3-0 Vicryl sutures. Antiobstruction sutures as described by Brolin5 were placed to prevent angulation at the enteroenterostomy. A 20- to 30-mL stomach pouch was created by sequential firing of the linear stapler. If a retrocolic technique was used, the Roux limb was passed through a window in the transverse mesocolon into the lesser sac, and mesenteric defects at enteroenterostomy, mesocolon, and Petersen sites were closed using nonabsorbable sutures. In cases where an antecolic technique was used, the Roux limb was passed through a small opening created in the omentum. Mesenteric closures were not undertaken in antecolic cases. Side-to-side gastrojejunostomy was performed using a linear stapler in all of the cases, and a double-layered, hand-sewn closure was used for resultant enterotomies. During the study period, 111 procedures were carried out with a preoperative diagnosis of intestinal obstruction out of a total of 2325 LRYGBPs performed. No evidence of intestinal obstruction was found in 9 cases, and these procedures were labeled as negative explorations. In the remaining 102 cases, intestinal obstruction was confirmed intraoperatively, yielding an overall incidence of 4.4%. Most of the patients in our series presented with abdominal pain, which was documented in 91 patients (82.0%). Other common presenting symptoms included nausea, seen in 54 patients (48.6%), and vomiting, seen in 52 patients (46.8%). Thirty-one patients (27.9%) were noted to present with all of the 3 mentioned symptoms. Table 1 summarizes the presenting symptoms in our group. The interval between LRYGBP and intervention for bowel obstruction varied greatly, ranging from 3 to 1215 days (mean, 313 days). Figure 1 represents the distribution of surgical explorations over time. Forty-five explorations (40.5%) were carried out within the first 6 months after LRYGBP, whereas 24 explorations (21.6%) were performed between 7 and 12 months after LRYGBP. We witnessed a steady decline in the number of explorations performed for intestinal obstruction with an increasing interval after LRYGBP. A total of 50 computed tomographic (CT) scans were performed in our series. Of these, 24 (48.0%) were diagnostic for bowel obstruction. The remaining 26 CT scans (52.0%) did not show evidence of bowel obstruction. When comparing positive vs negative CT scan results, the most common cause of bowel obstruction was internal hernias in both groups. A comparison of causes in positive vs negative CT scan results is shown in Table 2. Thirty-one (55.4%) of a total of 56 upper gastrointestinal (UGI) studies performed were diagnostic for intestinal obstruction, with the most common causes being Roux limb stricture (18 cases) followed by internal hernias (6 cases). Twenty-five UGI studies (44.6%) did not show any evidence of bowel obstruction. Interestingly, the most common cause encountered on exploration in this group was internal hernias (14 cases). A comparison of causes in positive vs negative UGI study results is shown in Table 3. Plain abdominal radiography results were indicative of bowel obstruction in 16 of 46 cases (34.8%). Sensitivities for the diagnosis of small-bowel obstruction were calculated to be 51.1%, 56.6%, and 33.3% for CT, UGI studies, and plain radiography, respectively. Table 4 summarizes imaging studies used in our series. The radiological studies did not indicate bowel obstruction in 38 cases (34.2%). Of these, subtle abnormalities prompting laparoscopic exploration were noted in 23 patients (20.7%), whereas the remaining 15 explorations (13.5%) were carried out solely on the basis of clinical suspicion. Of 102 cases of bowel obstruction confirmed on exploration, the most common cause in our group was internal hernias, seen in 55 patients (53.9%). The second most common cause of intestinal obstruction was scar-induced stricture of the Roux limb as it passed through the mesocolic window, encountered in 21 cases (20.5%). Adhesion-induced obstructions were encountered in 14 cases (13.7%). Remaining causes of small-bowel obstructions were angulation at enteroenterostomy observed in 7 cases (6.8%), port-site herniation and obstruction at enteroenterostomy level each in 2 cases (1.9%), and abscess-induced obstruction in 1 case (1.0%). Causes of bowel obstructions in our series are summarized in Table 5. Of a total of 2325 LRYGBPs performed, retrocolic Roux placement was used in 2006 cases while the remaining 319 cases were carried out using antecolic Roux placement. In the antecolic group, 6 cases of bowel obstruction were identified compared with 96 cases of bowel obstruction in the retrocolic group. This yielded incidences of 4.8% in the retrocolic group vs 1.9% in the antecolic group. This difference was statistically significant (P = .02) using χ² analysis. Of a total of 111 explorations, the laparoscopic technique was used in 92 cases (82.9%) and conversion to open procedures was required in only 19 cases (17.1%). Bowel resection was deemed necessary in 2 cases. There were no deaths in this series. The reported incidence of small-bowel obstruction after LRYGBP ranges from 1.5% to 5%.6-10 During the study period, 111 procedures were performed with a preoperative diagnosis of intestinal obstruction of a total of 2325 laparoscopic gastric bypasses performed. Nine explorations were considered negative, as no evidence of intestinal obstruction was found intraoperatively. In the remaining 102 cases, intestinal obstruction was confirmed intraoperatively, resulting in an overall incidence of 4.4%. It is unclear whether the laparoscopic approach results in a higher incidence of postoperative bowel obstruction. In an elaborate review including 3464 patients, Podnos et al2 reported a higher frequency of both early and late obstructions in laparoscopic bypasses when compared with open cases. Similar findings were noted in 2 prospective trials3,4 comparing laparoscopic and open gastric bypasses. Other reports6,11 suggested a similar incidence in laparoscopic and open cases. Nelson et al12 compared the incidence of small-bowel obstruction between 326 laparoscopic and 458 open gastric bypasses and found that the difference was not statistically significant. The interval between LRYGBP and intervention for bowel obstruction varied greatly, ranging from 3 to 1215 days (mean, 313 days). The duration between the index operation and exploration for intestinal obstruction was divided into 6-month intervals, and the cases were assigned to their respective groups according to the time of their presentation. Interestingly, the highest number of explorations was within the first 6 months after gastric bypass. This was followed by a consistent decline during the following 6-month intervals (Figure 1). Owing to altered bowel anatomy after gastric bypass, the radiological diagnosis of bowel obstruction can be quite challenging9,15-18 and can be easily overlooked by surgeons and radiologists who are not intimately familiar with post–gastric bypass anatomy.16,19 Radiological diagnosis of internal hernias, the leading cause of post-LRYGBP bowel obstruction in our series, can be very difficult because of their variable appearance and location.20 Moreover, afferent limb obstruction may present with completely normal small-bowel contrast series. The imaging protocol followed at our center for bowel obstruction is as follows. Patients presenting within the first 4 months after bypass typically undergo UGI series as the initial diagnostic study, as we believe that the incidence of proximal GI pathological findings is higher in this group. Conversely, patients presenting beyond 4 months after bypass usually undergo CT as the initial diagnostic imaging study unless plain radiography suggests obvious obstruction. A similar approach for radiological evaluation was described by Felsher et al10 in their account of small-bowel obstructions after LRYGBP. Upper gastrointestinal endoscopy was performed only when stricture at the gastrojejunostomy rather than small-bowel obstruction was a primary consideration, such as in patients presenting with dysphagia or vomiting without the presence of abdominal pain. As pointed out in earlier studies, the sensitivity of radiological studies to diagnose bowel obstruction after gastric bypass is fairly low. Our experience was similar. Computed tomography is one of the most commonly used diagnostic tools in the evaluation of intestinal obstruction. A total of 50 CT scans were performed in our series. Of these, 24 were diagnostic for bowel obstruction. The sensitivity of CT for intestinal obstruction after gastric bypass was found to be much lower (51.1%) compared with sensitivity of 80% to 90% to diagnose intestinal obstruction in the general population.13 When comparing the causes of bowel obstruction in positive vs negative CT scan results, we discovered that the CT scan appeared to be more likely to miss internal hernias, as only 13 of 32 patients with internal hernias undergoing CT were given a correct diagnosis. However, CT appeared to be quite effective in diagnosing adhesive obstructions (Table 2). Plain abdominal radiography was indicative of bowel obstruction in 16 of 46 cases, yielding a sensitivity of 33.3% as compared with a sensitivity of 70% to 80% seen in the general population.13 Thirty-one of 56 UGI studies performed were diagnostic for intestinal obstruction. This yielded a sensitivity of 56.6%. A detailed analysis revealed that only 6 of 20 patients with internal hernias undergoing preoperative UGI studies were diagnosed correctly. On the other hand, UGI studies were highly effective in diagnosing Roux limb stricture caused by scarring at the transverse mesocolonic window, as 18 of 20 cases were diagnosed correctly (Table 3). Thus, in our experience, the most sensitive test overall for diagnosing post–gastric bypass intestinal obstruction was the UGI study series. This is in contrast to the findings by Cho et al,9 where CT was noted to be the most accurate study. It is worth mentioning that 23 explorations were performed owing to the presence of “subtle signs” on imaging studies. These studies did not show definite evidence of bowel obstruction; however, they included findings that indirectly pointed toward an underlying pathology. The most commonly encountered subtle sign was an abundance of small bowel in the lesser sac as seen on CT (Figure 2) or in the left upper quadrant as seen on UGI studies. These findings, indicating internal hernia through the transverse mesocolon, were present in 9 cases. Dilatation of the stomach remnant and/or duodenum (Figure 3), which is indicative of afferent limb obstruction, was seen in 7 patients. Other findings included Roux limb dilatation on UGI studies, delayed contrast transit via the Roux limb seen on UGI studies, thickened bowel loops on CT, and mild small-bowel dilatation without obstruction to contrast progression. A summary of these findings is presented in Table 6. Obviously, a thorough knowledge of postbypass anatomy and a complete understanding of the etiology of bowel obstruction in bypass population are paramount to avoid overlooking these subtle signs. In their review of internal hernias, Comeau et al21 indicated that the most suggestive sign on CT for the diagnosis of internal hernia was a cluster of dilated bowel in the periphery of the abdominal cavity. In 15 patients, explorations were performed solely on clinical suspicion despite completely negative results on preoperative radiological studies. These patients had presentations similar to those of the rest of the group. Clinical findings that prompted exploration despite completely normal results on preoperative imaging studies included persistence, worsening, or recurrence of symptoms. Interestingly, pathological anatomy was confirmed on exploration in 11 cases. This emphasizes the fact that in the presence of strong clinical suspicion, laparoscopic exploration should be carried out even in the face of negative radiological workup results. The most common cause of obstruction in our group was internal hernias, seen in 53.9% of cases. This finding is consistent with observations made in other studies describing the use of retrocolic Roux placement.6 In studies with antecolic placement, the most common cause of obstruction was adhesive bands8 or stenosis at enteroenterostomy9 rather than internal hernias. Interestingly, internal hernias are reported to be a rare complication after open gastric bypass.22 The second most common cause of intestinal obstruction was scar-induced stricture of the Roux limb as it passed through the mesocolic window, encountered in 20.5% of cases. Surprisingly, adhesion-induced obstructions, which usually compose the leading cause of postoperative bowel obstruction in open surgery, were a small fraction (13.7%) in our series (Table 5). It is well known that the retrocolic technique results in a higher rate of intestinal obstruction when compared with the antecolic technique.6,8-10,21 Our findings replicated those of previous series. Of 319 patients in the antecolic group, bowel obstruction occurred in 6 cases, compared with 96 cases of bowel obstruction among 2006 cases of retrocolic bypass. The difference between the 2 groups was statistically significant (P = .02). However, the difference between the 2 techniques did not reach statistical significance (P = .24) when a comparison was performed after excluding the internal hernias and Roux limb stricture at the mesocolon, causes unique to retrocolic limb placement. After this exclusion, the incidence of bowel obstruction was 5 of 319 cases in the antecolic group vs 21 of 2006 cases in the retrocolic group. Contrary findings were noted in the series by Hwang et al8 after deduction of the causes of bowel obstruction inherent to antecolic Roux placement. Literature about laparoscopic management of post-LRYGBP intestinal obstructions indicates a high rate of conversion to open procedures when intestinal obstructions are managed laparoscopically. Champion and Williams6 reported a conversion rate of 2 of 13 cases of bowel obstruction, and Nguyen et al7 reported a conversion rate of 2 of 8 cases. Papasavas et al23 were able to manage 14 of 15 obstructions laparoscopically. We were able to successfully relieve obstruction laparoscopically in most of the cases, and conversion to open procedures was required in only 19 cases. Small-bowel obstruction in the bypass population can be complicated by bowel ischemia and often involves bowel resection. Hwang et al8 required bowel resection in 30 of 55 cases, and Capella et al24 reported resection in 3 of 68 cases. Frezza and Wachtel25 described resection in 14% of cases. In our series, only 2 patients required bowel resection. We follow a policy of maintaining a high index of suspicion and a low threshold for laparoscopic exploration, which perhaps resulted in the lower resection rate. The drawback of this policy is the potential for negative explorations, which were encountered in 9 of 111 cases in our series. However, the risks associated with delayed intervention outweigh the risks of a negative exploration. Small-bowel obstruction is a common complication after laparoscopic gastric bypass. Altered anatomy may present a diagnostic challenge, as the presentation and imaging modalities are often vague and inconclusive. Internal hernias, which composed the largest group of obstruction causes in our series, often elude diagnosis. A high index of suspicion is pivotal to prompt diagnosis and expeditious treatment of this condition. In the face of high clinical suspicion, surgical exploration should be carried out despite negative results on imaging studies. Surgeons and radiologists involved in the care of bariatric patients should be well versed in the subtle signs of obstruction in seemingly normal findings on imaging studies, which may be the only indication for surgery in many patients. We recommend that the initial surgical approach to these patients should be laparoscopic not only owing to the fact that most small-bowel obstructions after LRYGBP can be managed laparoscopically but also owing to minimal morbidity caused by a negative laparoscopic exploration. Correspondence: William O’Malley, MD, Department of Bariatric Surgery, University of Rochester, Highland Hospital, 1000 South Ave, Rochester, NY 14620 (william_omalley@urmc.rochester.edu). Accepted for Publication: June 4, 2007. Author Contributions:Study concept and design: Husain, Johnson, Boss, and O’Malley. Acquisition of data: Husain, Boss, and O’Malley. Analysis and interpretation of data: Husain, Ahmed, Johnson, Boss, and O’Malley. Drafting of the manuscript: Husain and O’Malley. Critical revision of the manuscript for important intellectual content: Husain, Ahmed, Johnson, Boss, and O’Malley. Statistical analysis: Husain. Administrative, technical, and material support: Husain, Ahmed, Boss, and O’Malley. Study supervision: Johnson, Boss, and O’Malley.